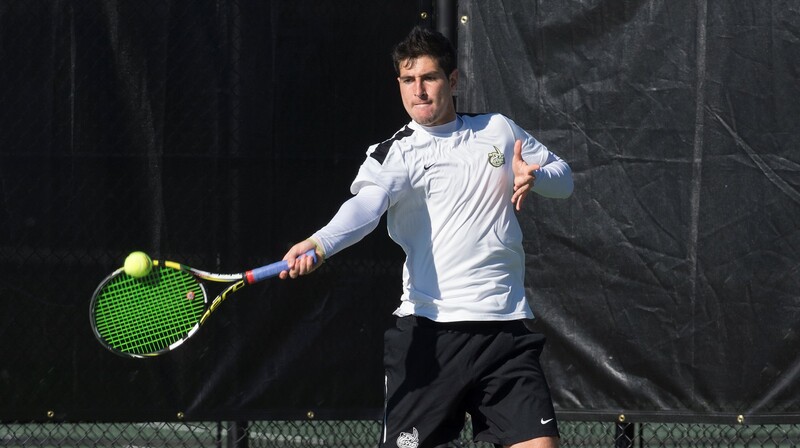 Boiling Springs, N.C – Behind three singles wins and two doubles victories, the Charlotte 49ers (8-6) defeated Gardner-Webb (4-9), 4-3, on the road for their third straight win. Charlotte won two of the three doubles matches to claim the doubles point. At number three doubles, Charlotte’s Max Benaim and Josh Aubrey won their third straight match with a 6-3 victory over Gardner-Webb’s Breno Plentz and Ross Gilbert. At number two doubles, Charlotte’s Alejandro Garcia Moreno and Oriol Puig Forne won their third straight match with a 6-4 win over Gardner-Webb’s Maximillian Scholl and Adam Schmidt. At number one doubles, Charlotte’s Sam Rice and Leonardo Menezes were trailing Gardner-Webb’s Paul Hogan and Johan Fors, 5-3, when the match was stopped since the 49ers had already clinched the doubles point. The two teams split the six singles matches. At number five singles, Charlotte’s Benaim won his sixth straight singles match with a 6-4, 6-0 victory over Gardner-Webb’s Stefano Puga. At number six singles, Charlotte’s Jensen Martin lost to Gardner-Webb’s Ross Gilbert, 6-1, 6-2. At number one singles, Charlotte’s Rice lost to Gardner-Webb’s Scholl, 6-2, 6-3. At number four singles, Charlotte’s Puig Forne defeated Gardner-Webb’s Plentz, 6-4 6-3, for his third straight win giving him 15 wins on the season. At number three singles, Charlotte’s Garcia Moreno defeated Gardner-Webb’s Schmidt, 6-2, 6-1, to clinch the victory for the 49ers. Garcia Moreno won his third straight match giving him 14 victories on the season. At number two singles, Charlotte’s Menezes lost to Gardner-Webb’s Hogan in three hard fought sets, 5-7, 6-4, 6-1.